Last week, Roosevelt University held a Day of Service to conclude a week of panels and performances exploring contemporary issues of social justice for the second annual American Dream Reconsidered Conference. 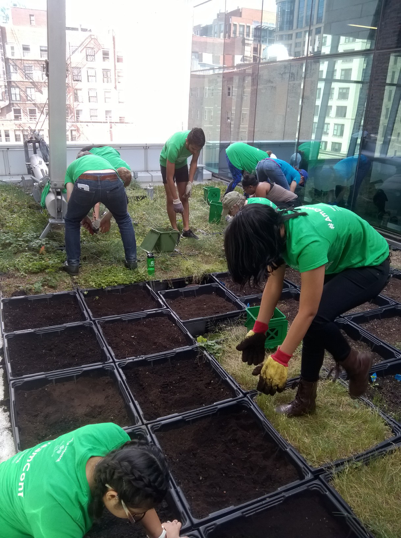 The Roosevelt community and general public were offered the opportunity to get involved with the WB Rooftop Garden on campus as one of several Service Day projects available for participation on Thursday, Sept. 14th. Volunteers were free to work on a number of different gardening activities we had available, from weeding to seed sowing to harvesting, as well as participate in an informal discussion about how environmental justice and sustainability are essential elements of achieving social justice and dissolving societal disparities. This discussion was intended to raise awareness of the many efforts undertaken on campus towards a more sustainable future, such as the waste services offered to achieve a 40% Waste Diversion rate, the plan with Retrofit Chicago to cut carbon emission through energy reduction, LEED building certification, and the use of low-flow plumbing to conserve water. With a special focus on the Rooftop Garden, we learned about the importance of urban green space to function as a means of water absorption in order to minimize stormwater runoff, which is of particular importance in the city of Chicago where urbanization over many decades has overwhelmed the capacity of the city’s combined sewer system and thus degraded water quality in its rivers. In addition to these environmental benefits, the Rooftop Garden provides fresh vegetables and herbs to the Dining Center which enhances the health and well-being of the Roosevelt community. With a source of onsite food production, the Dining Center is also cutting carbon emissions by eliminating the need for additional produce to be grown, harvested, packaged and transported to our Chicago campus. After about an hour of labor with soil and seeds, we invited our volunteers to conclude their service project shift with a snack prepared with ingredients that were harvested from the garden itself just two days prior! The Dining Center was gracious in preparing some delicious corn muffins with chive from the garden, as well as a beautiful salad of mixed greens comprised of kale, endive, and swiss chard from the gardens. Our Garden Team also gave out reusable Roosevelt water bottles to volunteers in an effort to influence a simple step towards a greener future by ditching the plastic, disposable (and privatized) water bottles. This is just a small example of how one can take deliberate and cooperative action to enhance sustainability in our everyday lives. 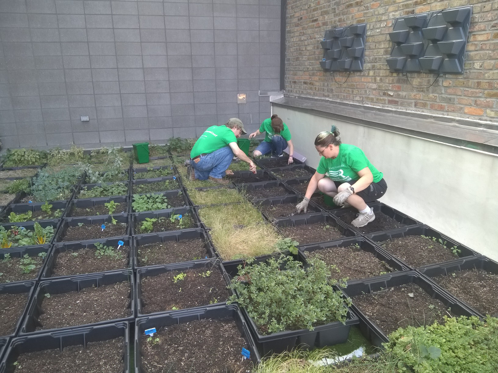 To take our sustainability efforts on campus even further, we initiated a very exciting project with the Rooftop Garden on Service Day! 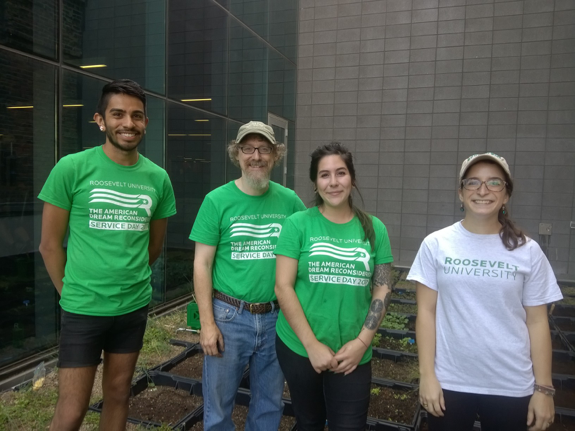 History was made at Roosevelt University as the first-ever Butterfly Weed seeds were sown to establish a rooftop pollinator garden/ restored prairie within the city’s downtown landscape. 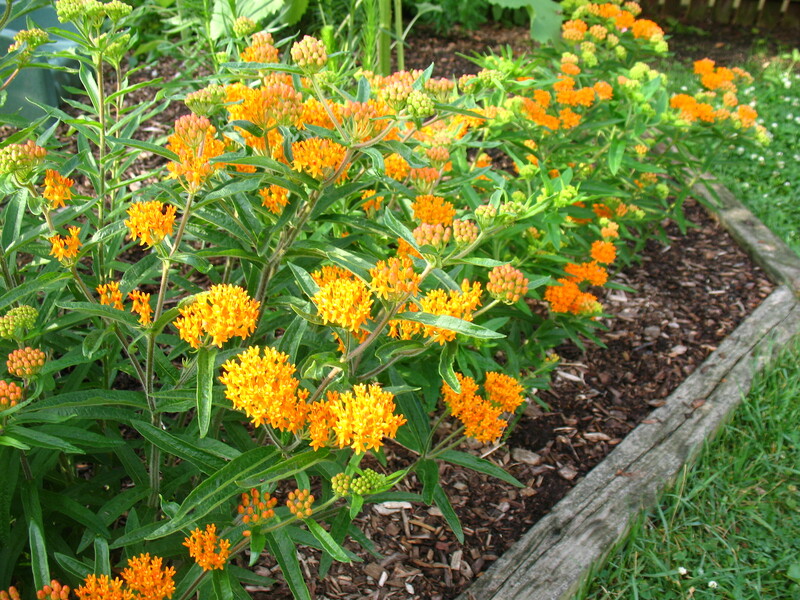 The importance of Butterfly Weed, which is a type of milkweed with a shallower root system suited for a rooftop garden setting, is tremendous as the Monarch Butterfly population has decreased by 80% in the past 2 decades, and ⅔ of our food is provided by the services of pollinators, such as the monarch and honey bee. 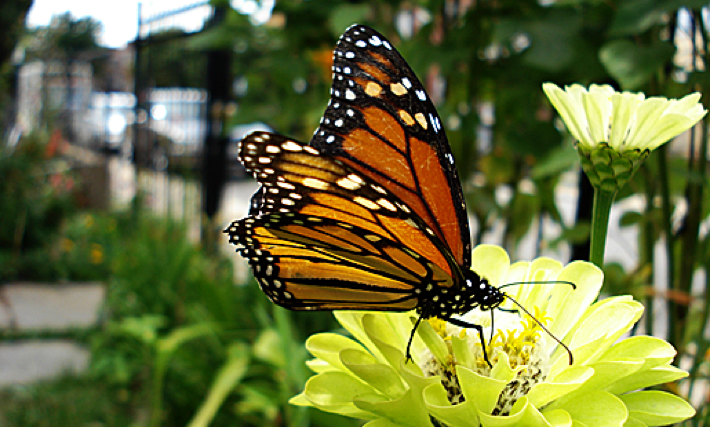 By making more milkweed available in Chicago, which is within the monarch’s migratory path, we can actively work towards enhancing urban conservation and wildlife habitat, for the environment’s sake as well as our own sustainability and well-being. To learn more about how YOU can help with this effort, check out this info from the US Fish and Wildlife Service. 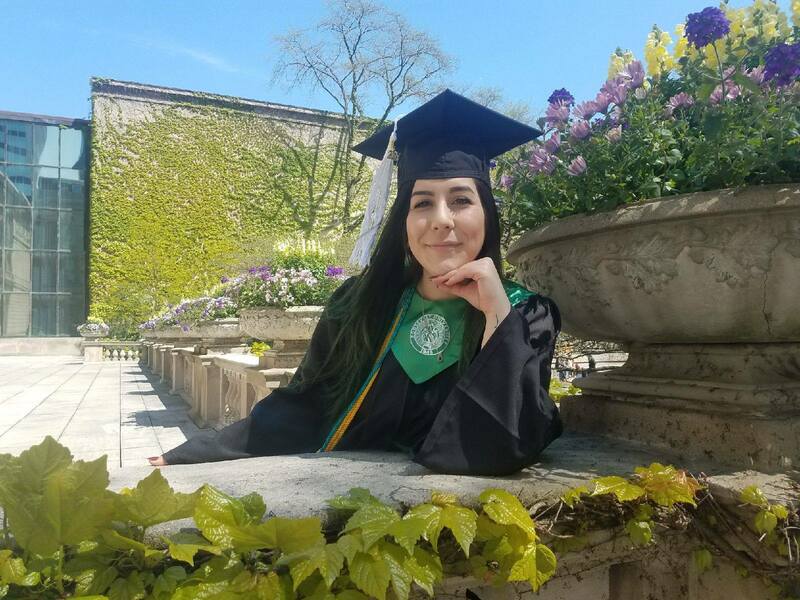 Diana Ramirez earned her BA in May 2017 at Roosevelt University in sociology and sustainability studies (with honors) and was an active member of the RU Green student environmental organization. This past summer, she worked with fellow SUST alum Moses Viveros as stewards of the WB Rooftop Garden at RU’s Chicago Campus, while also completing an environmental science research fellowship with the Urban Ecology Field Lab at the Field Museum in Chicago. This entry was posted in activities, alumni, biodiversity, ecology, education, events, faculty, food, green design, Roosevelt, service, students. Bookmark the permalink.